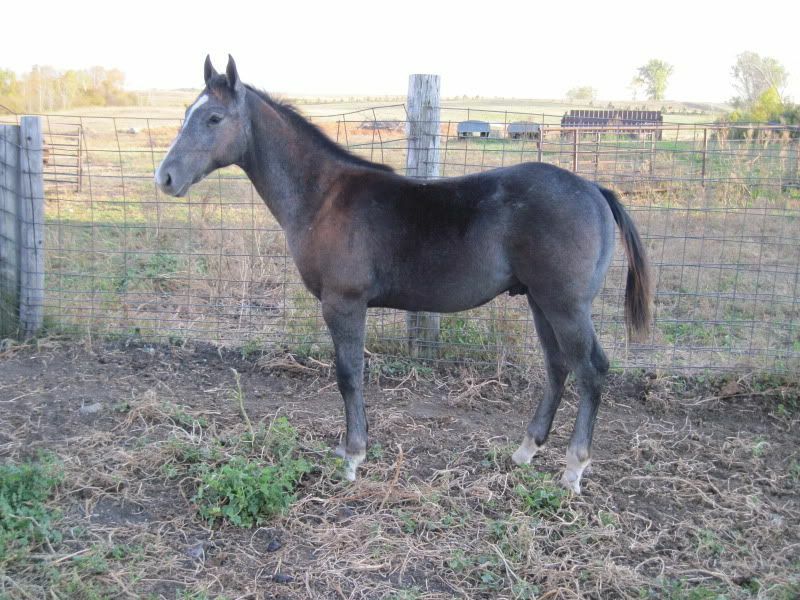 Hey i was looking at buy this baby and use him as a barrel horse, dont get me wrong i love my Hancock/ blue Valentine mare but he is so cute and nice breeding as far as i understand. He is pretty. I would worry only about those hooves right now. Not an expert but his hooves do look a bit dry. If you have a look on the market you can get alot of supplements and sprays to help this. If your not sure just get your farrier to have a look. Firstly, I am not a professional. So please take my "ideas" at how they look with the idea of approaching your own vet/farrier to review them with the pre-purchase exam. The fronts seem a bit pinched in the back and starting to splay/flare in the front. This may or may not be a problem. This may or may not be his natural hoof structure. Might even be due to a growth spurt at this age. There is nothing alarmingly wrong with the hooves. Personally, I would just make sure he is trimmed as often as he should be, because if he were mine, I would want to watch how those hooves develop if I was wanting a good, hardworking, and eventful and long career for him on the barrels. yeah my horses are on a regular schedule with the same shoer who has fixed past shoers mistakes. so no worries there but unforantly the year he was born was HOT HOT HOT in Arizona and the pictures reflect that. I know of a couples of things to help with the hooves. Is there anything else we dont like? anything good? Has a lot of growing time before he ever sees training begun...like years worth to keep that body sound and strong. 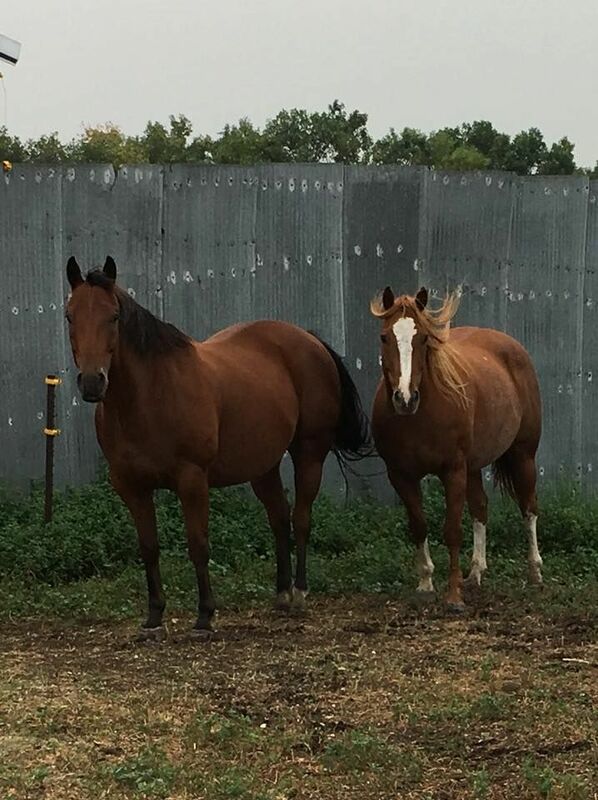 Aren't hocks better set low on a barrel horse than high as this guys are? I wish your pictures were better for critiquing...these actually hide quite a bit and raise questions where there may be no concern. 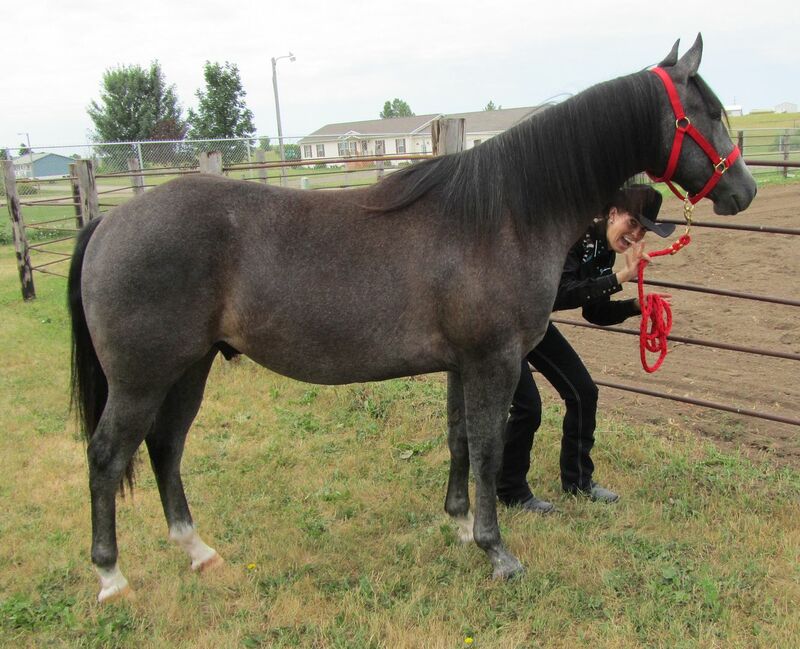 Yes, in general, you want to look for low hocks on a barrel prospect. You also want really well-rounded hindquarters. But this guy is YOUNG. Maybe I don't look at enough colts, but they're going to change so much I don't know how you can predict what their body is going to do. Sure, I could agree his hocks look a bit higher than you'd want in a barrel horse. And maybe not as well-rounded. But he might look totally different in a year. Honestly, he looks like he's got a Frenchman's Guy hind end on him. Of the ones I've seen, that's kinda what they look like. They also tend to do better with a more rollback type of turn (in general) and their conformation reflects that. Just for fun, here's my shotgun when he was 6 months old, and freshly purchased from auction! (although we knew his owners) Yeah, he's not standing under himself very well. Just FYI he is NOT frenchmans guy bred. And then age age 3. And last year at age 7. Now my mother's horse is a Frenchman's Guy grandson. 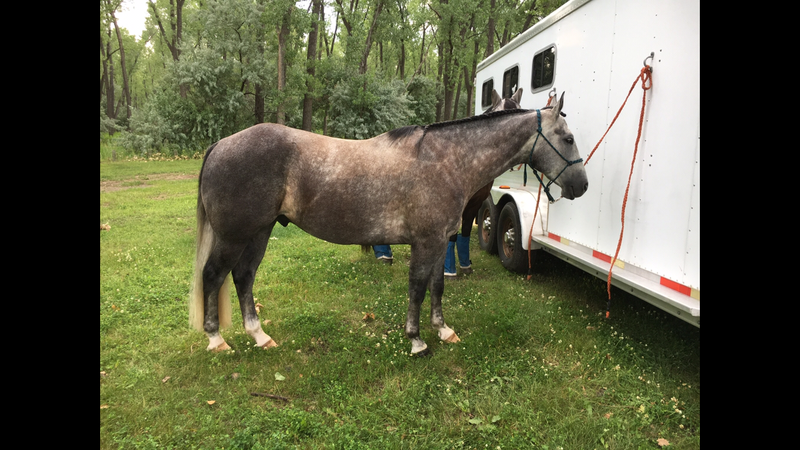 We bought him and my horse at the same time, so here he is as a 6 month old. 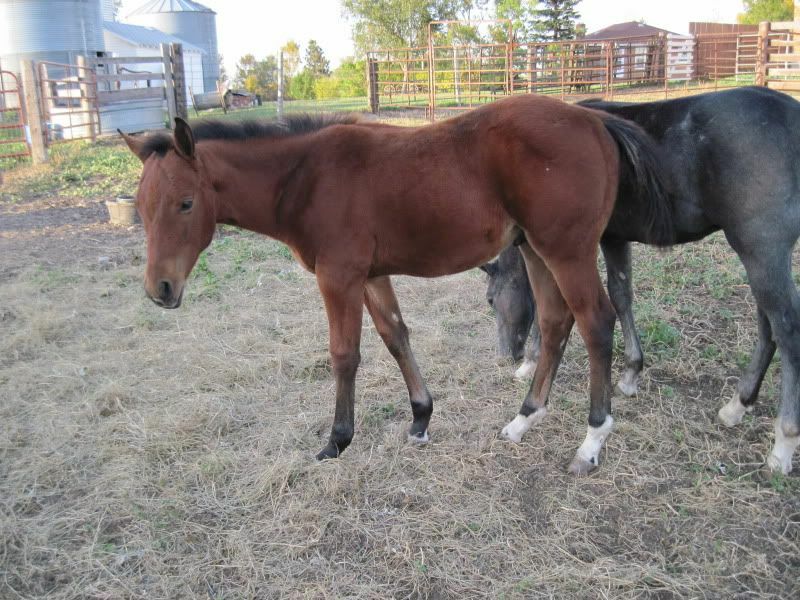 He really was the "funny looking" type colt. The only older photo of him I have on my computer at the moment is this one (he is on the left) and it is not a good confo photo at all, LOL. (yes he is fat, as is my ol' Red) Taken last year when he was 7. I would say his hocks are higher than Shotguns, and certainly higher than Red standing next to him. and he's a little sickle hocked as well (not bad) but he is a QUICK son-of-a-gun. Of course, he's also cutting bred on the bottom so that may have something to do with it. Has no problem doing a wicked rollback either. So his "higher hocks" don't seem to bother him one bit.